Respironics InnoSpire Elegance Compressor Nebulizer System efficiently works with the proven SideStream aerosol technology and provides fast, reliable and efficient drug delivery to patients at home. InnoSpire Elegance features an active venturi system, which provides air flow in addition to that supplied by the compressor, resulting in the faster drug delivery and shorter treatment times. A powerful compressor and a compact design combine together to create a nebulizer system, which patients will value. Its innovative design consistently produces a high-quality aerosol. SideStream nebulizer features an active venturi system that is used to provide air flow in addition to that supplied by the compressor, resulting in faster drug delivery with shorter treatment times. 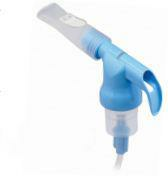 They are easy to use with fewer parts to be assembled or cleaned than other conventional nebulizers. Its unique design provides consistent medication delivery time after time. This elegant performer weighs only 3.3 pounds and works efficiently with the proven SideStream aerosol technology. Respironics InnoSpire Elegance System includes a handset, docking station, filter and power cord. Elegance is compliant with the international safety and essential performance standard IEC 60601-1 third edition and its amendments. 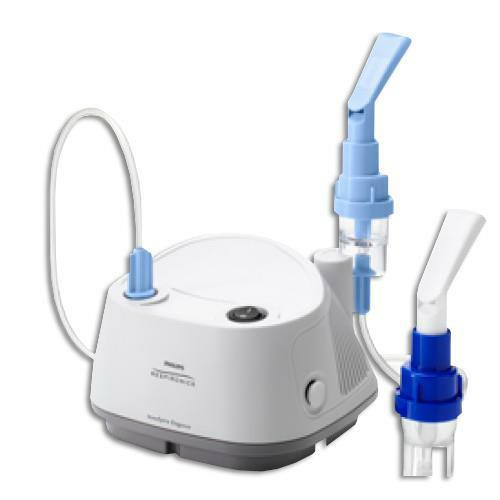 Breath-enhanced SideStream Plus Nebulizer has an easy-action inspiratory valve that opens on inspiration to boost medication delivery and closes on exhalation, preserving medication and minimizing waste. Less pressure is required to open the inspiratory valve as compared to other breath-enhanced nebulizers. Also, there is no need to remove the valve when using a mask, making the treatments easy for pediatric and elderly patients. Size 4.2" x 6.5" x 6.5"
Does the Elegance come with the Venturi system or is that additional and what is the cost? Respironics InnoSpire Elegance Compressor Nebulizer System comes with Active Venturi System.There is no additional cost for it. I presently use a Philips respironics InnoSpire compressor nebulizer system. It is an ImnoSpire Elegance. I would like to purchase a new one because mine is a few years old and getting noisy. The # on the box is REF 1104330. I am also interested in an active venturi system to cut down on treatment time. Do you sell them and what is the price? After how long the Side Stream Plus reusable nebulizer be replaced? Side Stream Plus Reusable Nebulizer needs to be replaced after six months of regular use. Can you use it without AC power supply? Like while traveling etc? No, this requires an Ac power. Does this unit need to be cleaned inside periodically to prevent infections? How often should the tubing, mask, or any other parts be replaced or cleaned? Thank you for contacting us with your questions regarding the InnoSpire Elegance. The device has no routine maintenance other than a visual inspection, cleaning the outside of the unit with a clean, damp cloth, and filter replacement (which should be replaced when it appears discolored or wet). There is nothing that should be done to clean the device internally. There is a filter on the device that should be changed when it becomes discolored. The time frame for changing the filter will vary based on frequency of use and home environment (pets, smokers, ect..) This device comes with the SideStream nebulizer. There is a reusable hand set and a disposable hand set. The reusable one can be used for up to 6 months and the disposable one is designed for 2 weeks of use. Both handsets should be washed after each use with warm water and a mild dish soap such as Ivory or Dawn. Rinse well and allow to air dry. The tubing should NOT be washed. The mask can be washed with warm water and mild soap as well.